pieces at auctions. In recent years, Daniel Seagle pottery--and pots made by other Seagle School potters--has commanded high prices, depending on rarity and condition. Likely, these collectors and dealers are lured by Seagle's strong design sense and perfectionism. If Daniel Seagle were living today, he likely would be surprised by what could be described as a "wind(fall) of change." In 140 years, prices for his pottery have jumped from 10 cents to more than $1,000 a gallon! To review some of the recent high bids on Seagle pottery on the Live Auctioneers Web Site, click here. On Jan. 19, an absentee bidder from Georgia bought a 10-gallon Daniel Seagle storage jar for $6,000 at an estate-sale auction in Hickory, N.C. conducted by ﻿Allman Auctions.﻿ The jar had old white paint residue and some white "spider web" lines on the walls, possibly caused by salt (pickles?) leaching through. "You be the judge of what caused it," the auctioneer told the bidders. --Signed John Goodman storage jar, 16" tall, $500, with an "est. 3" chip out of the rim. There has been some kind of putty put over chip a long time ago. The jar also has several hairlines." --2-gallon signed James Franklin Seagle storage jar, "...in excellent condition, free of chips or cracks," $1,050. --1/2-gallon signed Daniel Seagle jug, in "good condition, but does have a repaired handle," $500. A 4-gallon, signed Daniel Seagle jug in excellent condition (right photo) sold for $8,600 plus a 10 percent buyer's premium and state sales tax on July 4, 2011, at Perry Aucton Co., Statesville, N.C., to a pottery ﻿collector. Auctioneer Tim Perry said the jug was found in an outbuilding, and this auction was the first time it had been offered for sale. He described the jug as "the belle of the ball" that day. A 1-gallon, signed James Franklin Seagle jug in excellent condition (only a small chip inside of the neck) sold for $1,500, plus a 10 percent buyer's premium and state sales tax on Oct. 9, 2010, at Perry Aucton Co., Statesville, N.C., to a pottery dealer. The jug was almost 13" tall. A 2-gallon, signed James Franklin Seagle storage jar in very good condition sold for $2,800, plus a buyer's premium and state sales tax on July 11, 2010, at C & A Auction House, Ramseur, N.C. It had some roughness to the edge of one lug handle and a small hole where a small stone (or "pearl") apparently fell out. The hole did not go all the way through the clay. On the same afternoon, a 1-gallon Daniel Seagle jug with a repaired handle sold for $700, plus a buyer's premium and state sales tax. applied handle sold on eBay for $2,575.76 on April 15, 2010. This jug was in perfect condition (except for "a tiny rim flake") and stood 12.5" tall. The seller, based in Benton, AR, did not mention Daniel Seagle by name in the description of the jug. A 2-gallon, signed John Goodman storage jar sold on eBay for $482 on March 27, 2010. Offered by a seller in Gastonia, N.C., it was 11" X 10" wide and had chips on the lip and each handle. A 1-gallon John Goodman jug, with "JG" stamp, sold on eBay on May 28, 2009, for $700 plus shipping. This Seagle School jug, with minor rim chips, was offered by a Georgia dealer. On April 29, 2009, R. Giles Moss Auction, Rockwell, N.C., sold these Seagle School pots: A 3-gallon Daniel Seagle signed jug, overall good condition, for $4,620, and a 5-gallon James Franklin Seagle storage jar in overall good condition (a few small handle chips) for $3,190. The jar's gallons mark consisted of a Roman number "V" instead of a "5." Both pots were from a Rowan County, N.C., estate, and these prices include a 10 percent buyer's premium. A 5-gallon, James Franklin Seagle storage jar sold for $4,900 on 9/13/08 at Leland Little Auction & Estate Sales Ltd., Hillsborough, N.C. The jar's gallons mark consisted of a Roman number "V" instead of a "5." A one-gallon John Goodman jug, 11" tall, with neck chips/repair, sold on eBay for $747 in August, 2008. 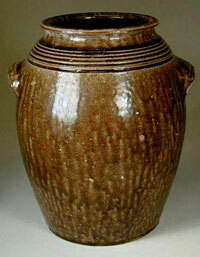 An Isaac Lefevers storage jar sold for $8,500 at Brunk Auctions, Asheville, N.C., on 3/24/07. One lug handle was stamped "VII," indicating 7 gallons. Some chips and "sides with scattered small star cracks." 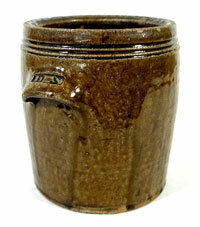 A monumental "JCM" storage jar sold for $13,000 at Brunk Auctions, Asheville, N.C., on 3/24/07. This Catawa Valley potter, known only by his "JCM" mark, may have learned the trade in The Seagle School. A 10-gallon Daniel Seagle storage jar sold for $11,000 (and attracted 34 bids) at Leland Little Auction & Estate Sales Ltd., Hillsborough, N.C., on 6/25/05. Chips to one handle & small hole on shoulder.